L: Relief grave stele. "Rhodia." Fayum, 6th c. Rhodia, stands in a portico, with a shaw that forms a nimbus to indicate her sanctity. Geometic linear body with symptomatic feet. Here is an example of the important "orante in portico" theme. Traditional ankh cross with Alpha-Omega enclose a symbolic rose. The representation of Christ abstractly, transcendentally, in terms of a symbol, probably reflects a hesitancy to admit Christ's imperfect humanity in the Greek speaking world. C: Wool on linen textile with portrait of a man with nimbus and heart. Egyptian-Coptic. 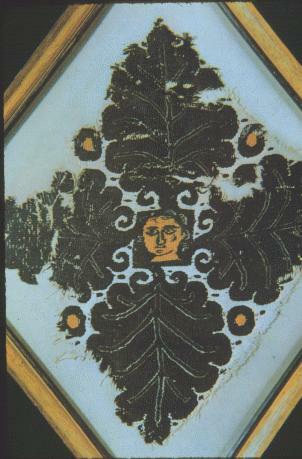 Akhmin, 5th c. Recalls mummy portrait realism, but with popular expressive coloration. (Paris, Coll. B�rard). R: Egyptian wool on linen textile decorative panel. 5th c. A.D. (Paris: Coll. B�rard). 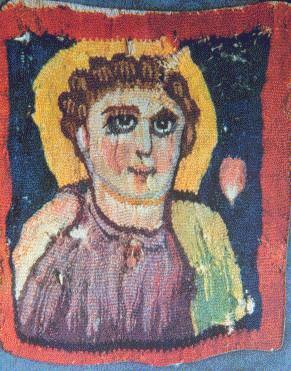 Early Christian themes in textiles tended to be simple, such as here the vine leaves and head, a combination which suggests it is a portrait of Christ. The Coptic and Syrian churches, influenced by the Greek philosophical tradition in the East Mediterranean, insisted Christ could not really be human and thus imperfect. This panel is probably Monophysite in that it represents Christ as immortal, rather than human.